Ancient Stones - Borders - 006 Standing Stones, Sheriff Muir, Peebles. 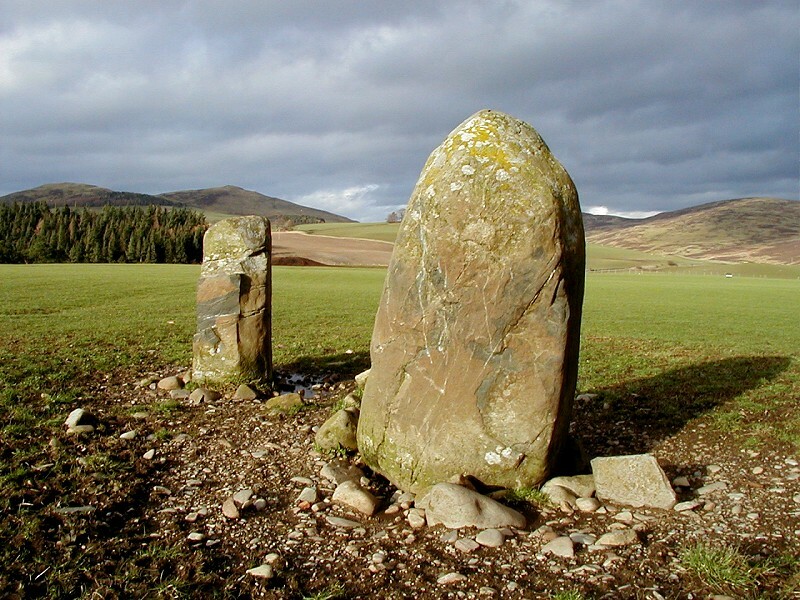 An open cultivated field about 4 miles west of Peebles, at Lyne Station, forms the setting for two standing stones, set 2.10m apart and each around 1.30m in height. There are other small stones in the area between these two stones but these are probably clearance stones from the surrounding field. No trace can now be seen of a curved line of small boulders less than 0.30m high which once ran eastwards from the stones. From Peebles take the A72 west towards Glasgow. After 4 miles turn left onto a minor road leading to Lyne Station, cross the bridge and head straight on pass some cottages and up the hill. The stones can be seen in the cultivated field to the right. Pinkie's Hole can be found in the Scot's Pine wood running along the south side of the road. Although the road is narrow it is relatively quite and vehicles may be left by the road side. Please keep vehicles well into the side to allow farm vehicles and other traffic to pass. There are two traditions associated with this site. One suggests it to be the remains of a Druid temple with Pinkie's Hole, a depression in the wood beside the road to the south, being the sacristy where the sacrificial procession was gathered. 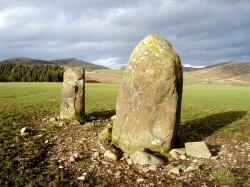 Pinkie's Hole and the two standing stones are aligned in a north-south direction in line this Pinkie's Hole. The other claims that the stones mark the site of a fallen Border Chieftain and that Pinkie's Hole was for those of lower status. It has been suggested that the stones are the remains of a burial cairn but we shall probably never know the true story. Pinkie's Hole in reality is probably a gravel pit dating back to Roman times and is one of many that can be seen in the area. It may have been worked by the garrison at Happrew fort, about 200m to the west. Driving along the busy A72, this site is hidden from view from the main road and only when you take a minor road through Lyne Station can it be seen in the open field to the north. This mood of this site changes with the weather and is at its best with thunder clouds in the east and a low evening sun setting in the west. However, best of all is a visit at night under a clear sky when the stones glow faintly in the moonlight. You may also hear the cry of a tawny owl in the wood to the south and, just perhaps, witness a UFO buzzing around the Meldon Hills to the north. But then again you might not!